13922: Waterman Lady Patricia: rare black hard rubber lever-filler with "Cable Twist"sterling silver overlay, 11.1 cm long; a few minor marks and bumps but excellent overall appearance, unusually good condition for this model, elegantly engraved monogram on top of clip button. this is only the third example of this seldom-seen model we have offered in the last 15 years. 10048: Waterman 52V Persian pencil: uncommon and desirable material, 11.1 cm long, gold filled trim, good imprint, name on barrel, a small gouge to edge of cap crown (see details); uses 1.1 mm lead. 13214: Waterman Lady Patricia pencil: "Persian" celluloid, 10.7 cm long, chrome plated trim, uses 1.1 mm lead, excellent color and imprints, but age shrinkage crack in barrel (see detail). Fully functional and attractive. 12033: Waterman pencil: tan veined grey pearl "Steel Quartz", 12.5 cm long, chrome plated trim; strong imprints, scrape to top back of cap, uses 1.1 mm lead, matches 3 fountain pen. 12035: Waterman pencil: tan veined grey pearl "Steel Quartz", 10.6.5 cm long, gold filled trim, uses 1.1 mm lead, matches 92V fountain pen. 9338: Waterman 92 pencil: red and gold, 12.7 cm long, gold filled trim, uses 1.1 mm lead, bold imprints, beautiful color -- a scarce and desirable material. 13220: Waterman 91V pencil: red pearl with green streaks, 10.6 cm long, gold filled trim, uses 1.1 mm lead, propel and retract mechanism, matches 92V pen; export-style imprints, less common color. 9500: Waterman lever box assembly: original new old stock, 21.5 mm long, fits 16 mm long, 2.2 mm wide barrel slot, gold plated; as used on pens such as the 3, 2V, 92, 92V, etc. 13643: Waterman Lady Patricia Ink-Vue set in box: compound lever pump-filler in black, 11 cm long, chrome plated trim, with matching pencil (uses 1.1 mm lead, mechanism propels and retracts); price sticker on pen, barrel transparency is perfect, original sac is petrified, but has not been replaced. Box is extra-fancy version, some staining and fading, clean original instruction sheet. 13359: Waterman Patrician set: oversize lever-filler, 13.7 cm long, with matching twist-action pencil, uses 1.1 mm lead; black and pearl "Nacre" celluloid, chrome plated trim, hard rubber ends, large Patrician nib is smooth and responsive. Good clean imprints, fine color with only slight ambering at top of pen cap, name on pen barrel, scratch at junction of turning cone and barrel on pencil (see detail), pen has later production lever of Hundred-Year style. 13481: Waterman Hundred Year: elegant black Lucite lever-filler, 12.9 cm long, gold filled with Ideal globe logo on clip rivet, hard to find superfine tipped Hundred Year #17 nib; name lightly and unobtrusively imprinted on barrel. 13443: Waterman nurse's pen: ivory pearl lever-filler, 11.6 cm long, gold filled trim, red painted band at top of cap worn, overall color more even than usual. 10218: Waterman Hundred Year: rare white doctor's pen, 13 cm long, gold filled trim with three barrel bands, globe logo on clip boss; one 1mm stress crack at the corner of the clip cutout (stable, caused by someone forcing the clip sideways), otherwise no damage or defects, noting initials engraved on the central barrel band. Nib has just enough flex to give a bit of shading with moderate pressure..
13158: Waterman 352 pencil: blue pearl, gold filled trim, original price sticker on back of cap. New old stock, from the Oakland Japantown hoard. 11664: Waterman Junior pencil: unusual short-lived model with over-the-top military clip with globe logo on side and top, blue-green pearl color not used in USA production; 11.6 cm long, nickel plated trim, made in Canada, uses 1.1 mm lead, some scuffs and scratches. 9501: Waterman lever box assembly: original new old stock, 23 mm long, fits 17 mm long, 3 mm wide barrel slot, gold plated. 12876: Waterman 515: cordovan lever-filler, 12.8 cm long, gold filled trim, made in Canada, new old stock with nib grade sticker on cap, some age spotting to plating of clip rivet, stress hairline at base of nib clearly a manufacturing defect, does not appear to affect function. 11422: Waterman 402: rare lever-filler with striped parti-colored barrel, green and grey, green cap, gold filled trim, 12.7 cm long, with original price band. Usually considered a prototype, but clearly test-marketed in small numbers. Original sac is stiff, has not been replaced. 12598: Waterman JiF four-color pencil: chrome plated brass, 13.7 cm long, uses 1.1 mm lead; new old stock, no packaging; French-made for the French market, very solid construction, from a long-established Paris pen shop. 13803: Waterman X-Pen: black capillary-filler, hooded nib, 13.6 cm long, fills by dipping nib end into ink; like new, but has been filled. 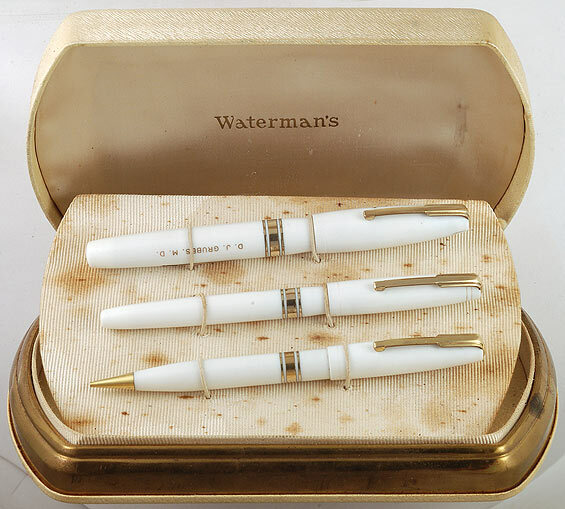 Uncommon late Waterman attempt to emulate Parker's 61; most X-Pens found are the smaller Junior size.